I confess I’ve been putting this one off for a long time. Colin was a friend of mine, and when he died suddenly in 2011, he left behind too few books, and, as of now, Damage Time was the only one I hadn’t read. I didn’t want to read it know that once it was over, there would be no more of Colin’s books to read. 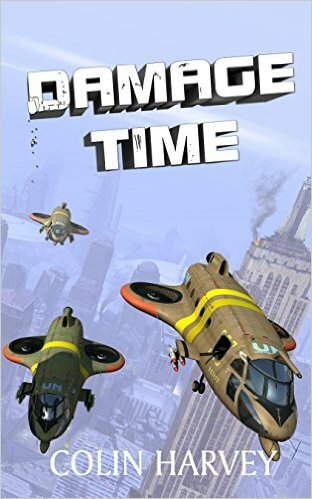 But now Wizard’s Tower have produced shiny new hardbacks of both Damage Time and Winter Song, the two books of Colin’s published by Angry Robot, and the time was right to get stuck into Damage Time at last. It’s a slice of near-future SF set in a future New York that has suffered badly since the oil ran out. Pete Shah is a jaded, aging cop in a depleted force, and a Memory Association Specialist – an officer whose job is to read and witness the final thoughts of murder victims as recorded on their ubiquitous eyepieces. It’s a dirty job for a straight cop, and when Pete is framed for murder, he discovers just how dirty organised crime in the city can get. One of the more unsettling aspects of Shah’s New York is how close it is to our own, even while the memory-ripping technology used by the villain is pure spine-tingling SF. If you’re a fan of gritty cop dramas like The Wire, even if you’re not particularly into SF, Damage Time may pique your interest with its compelling, troubled protagonist, its decaying city, and its aura of barely-suppressed violence. This new hardback and ebook edition from Wizard’s Tower also includes a brief introduction from Lee Harris, Colin’s friend and his editor at Angry Robot, and features the original cover art by BristolCon GOH Chris Moore. These are lovely editions of both Damage Time and Winter Song that would make perfect companion volumes on your bookshelf.